Today's customers are demanding service that is faster, better, and more personalized than ever before. How can organizations ensure that they are prepared to meet that challenge? 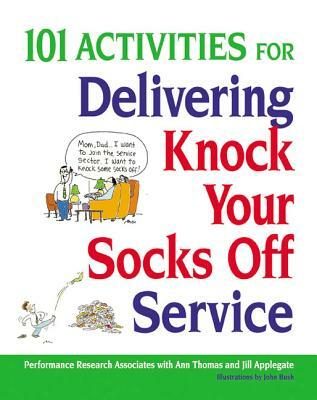 The latest addition to the best-selling Knock Your Socks Off Service(R) series, 101 Activities for Delivering Knock Your Socks Off Service provides readers with the practical tools and cost-effective training required to help meet their customers' needs. Taking the unique position of seeing things from the customer's perspective, this collection of fun and enlightening exercises teaches customer service managers and employees valuable ways to help their organizations provide world-class service, and helps them create an action plan for improvement. Written in the same accessible and humorous style that made Delivering Knock Your Socks Off Service so popular, this companion guide covers such topics as: * how to say no * empathy vs. sympathy * service recovery * listening * email * telephone skills * customers from hell * winning words and soothing phrases * anticipating customer needs * building reliability * customer feedback * keeping a stress log * and more These simple but effective activities take only minutes, but deliver truly powerful, lasting results. Ann Thomas and Jill Applegate of Performance Research Associates, Inc. (Minneapolis, MN) carry on the legacy begun in 1972 by the late service legend, Ron Zemke. The firm consults with corporations and nonprofits of all sizes around the globe.